The Jovian system contains several smaller, irregular moons that we know very little about. These satellites of the planet Jupiter are extremely small, and many were not discovered until the Voyager and Galileo encounters with Jupiter or by astronomers using the Hubble space telescope. Because of their small size, it is possible that some of these moons may be captured asteroids or comets. These recent discoveries bring the total number of Jovian moons to 63. Below is a listing of some of the the largest of these moons in the order of their distance from Jupiter. Images that appear on this page are the best available at this time. You may access information on one of the moons directly by clicking on its name below. Metis [MEE-tis] is the innermost of Jupiter's moons. It was named after a Titaness who was the first wife of Jupiter in Roman Mythology (Zeus in Greek). Metis was discovered by Stephen Synnott in 1979 using data from the Voyager 1 spacecraft. It was one of the first two moons discovered by the Voyager project. Metis is one of two moons that orbit inside Jupiter's main ring. It is possible that these moons are the source of the material that forms the rings. Very little is known about Metis at this time, but it is probably composed of a mixture of ice and rock. Since Metis lies within the Roche limit, its orbit will eventually decay and it will crash into Jupiter. 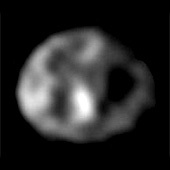 Adrastea [a-DRAS-tee-uh] is the second innermost of Jupiter's moons. It is also one of the smallest moons in the Solar System. In Roman mythology, Adrastea was the daughter of Jupiter (Zeus) and Ananke and was the distributor of rewards and punishments. Adrastea was discovered by David Jewitt & E. Danielson in 1979 using data from the Voyager 1 spacecraft. It was one of the first two moons discovered by the Voyager project. Adrastea is one of two moons that orbit inside Jupiter's main ring. It is possible that these moons are the source of the material that forms the rings. Very little is known about Adrastea at this time, but it is probably composed of a mixture of ice and rock. Since Adrastea lies within the Roche limit, its orbit will eventually decay and it will crash into Jupiter. Amalthea [am-al-THEE-uh] is the third of Jupiter's moons and is the fifth largest. It was named after the nymph who nursed the infant Jupiter (Zeus) with goat's milk in Roman mythology. Adrastea was discovered by Edward Emerson Barnard in 1892 using the 36-inch refractor telescope at Lick Observatory. It was the last moon in the Solar System to be discovered by direct visual observation. 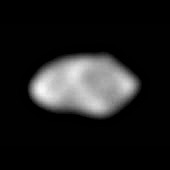 Amalthea is very irregular in shape and is covered with craters. Some of these are quite large when compared to the size of the moon itself. The largest of these craters is known as Pan and is 62 miles (100 km) in diameter. Another crater, Gaea, is 50 miles (80 km) in diameter. 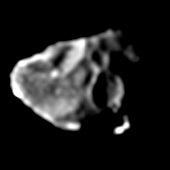 Amalthea's surface is dark red in color. It is, in fact, the reddest object in the Solar System. This red color is believed to be caused by sulfur ejected from Jupiter's moon, Io. Amalthea's orbit is synchronous, and it orbits with its long axis pointed towards Jupiter. The composition of this moon is believed to be similar to that of asteroids. Amalthea radiates more heat than it receives from the Sun. This is probably due to electrical currents produced by interaction with Jupiter's magnetic field. Thebe [THEE-bee] is the fourth of Jupiter's moons. It was named after a nymph who was the daughter of the river god Asophus. 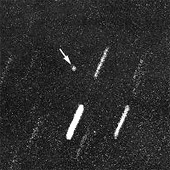 Thebe was discovered in 1979 by Stephen Synnott using data from the Voyager 1 spacecraft. Very little is known about Thebe. What we do know is that its orbit around Jupiter is synchronous, and its leading side shows four large craters. Leda [LEE-duh] is the ninth of Jupiter's moons and is the smallest. It is also the smallest known moon in the Solar System. Leda was named after the queen of Sparta and mother of Hellen and Pollux. It was discovered by Charles Kowal in 1974 and was the last Jovian moon to be discovered from Earth. Very little is known about Leda except that it is one of the smallest moons in the Solar System, and its orbit is highly inclined to Jupiter's equator. Some astronomers believe it may be one of four moons that could be the remnants of an asteroid that was captured by Jupiter and broken up by its gravitational forces. Himalia [him-MAH-lee-uh] is the tenth of Jupiter's moons. It was named after a nymph who bore three sons to Zeus (Jupiter) in Greek mythology. It was discovered in 1904 by the Argentine-American astronomer Charles Dillon Perrine at Lick Observatory. Very little is known about Himalia except that its orbit is significantly inclined to Jupiter's equator by almost 28 degrees. Some astronomers believe it may be one of four moons that could be the remnants of an asteroid that was captured by Jupiter and broken up by its gravitational forces. Lysithea [ly-SITH-ee-uh] is the eleventh of Jupiter's moons. It was named after a daughter of Oceanus who was one of Zeus' lovers. Lysithea was discovered by Seth Barnes Nicholson in 1938. Very little is known about Lysithea at this time except that it has a highly inclined orbit. Some astronomers believe it may be one of four moons that could be the remnants of an asteroid that was captured by Jupiter and broken up by its gravitational forces. Elara [ee-LAH-ruh] is the twelfth of Jupiter's moons. In Greek mythology, Elara and Zeus (Jupiter) were the parents of the giant, Titys. Elara was discovered in 1905 Charles Dillon Perrine at Lick Observatory. Very little is known about Elara except that is has a highly inclined orbit. Some astronomers believe it may be one of four moons that could be the remnants of an asteroid that was captured by Jupiter and broken up by its gravitational forces. Ananke [a-NANG-kee] is the thirteenth of Jupiter's moons. In Greek mythology, Ananke and Zeus (Jupiter) were the parents of Adrastea. Ananke was discovered by Seth Barnes Nicholson in 1951 with the reflector telescope at Mount Wilson. Very little is known about Ananke except that its orbit is extremely inclined at 147 degrees, and it is one of the four moons that orbit Jupiter in a retrograde motion. Elara [KAR-mee] is the fourteenth of Jupiter's moons. In Greek mythology, Carme was the mother, by Zeus, of a Cretan goddess named Britomartis. It was discovered in 1938 by Seth Barnes Nicholson with the reflector telescope at Mount Wilson. Very little is known about Carme except that its orbit is extremely inclined at 163 degrees, and it is one of the four moons that orbit Jupiter in a retrograde motion. Pasiphae [pah-SIF-ah-ee] is the fifteenth of Jupiter's moons. In Greek mythology, Pasiphae was the wife of Minos and mother, by a white bull, of the Minotaur. It was discovered in 1908 by P. J. Melotta in Greenwich, England. 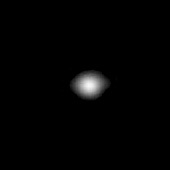 Very little is known about Pasiphae except that its orbit is extremely inclined at 147 degrees, and it is one of the four moons that orbit Jupiter in a retrograde motion. Sinope [sah-NOH-pee] is the sixteenth and outermost of Jupiter's moons. It was named after a woman in Greek mythology who was unsuccessfully courted by Zeus (Jupiter). It was discovered by Seth Barnes Nicholson in 1914 with the reflector telescope at Mount Wilson. Very little is known about Sinope except that its orbit is extremely inclined at 153 degrees, and it is one of the four moons that orbit Jupiter in a retrograde motion.